Rare urn ‘Barockurnan’ produced by Näfveqvarns Bruk in Sweden. Rare faun urn designed by Ivar Johnsson. Produced by Näfveqvarns Bruk in Sweden. Cast iron planters produced in Sweden. Cast iron urn produced in Sweden. 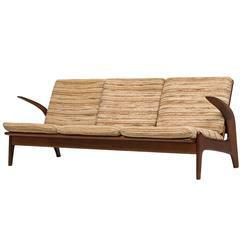 Rare sofa designed by Rolf Rastad & Adolf Relling. Produced by Arnestad Bruk in Norway. Classic pair of medium sized black cast iron planters. Three lovely classic tall black cast iron urn planters. Top opening 16” Bottom opening in urn 8”.